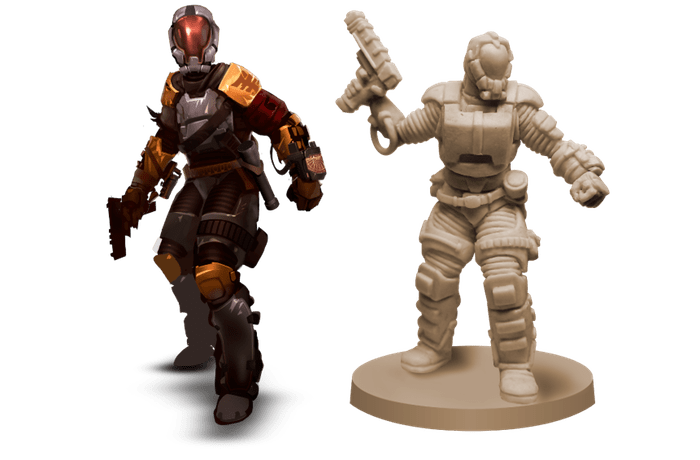 Ok so maybe not as much as some other Kickstarters but the single piece plastic miniatures shown so far do look good and you are also getting a host of kickstarter extras as well that arent on the image. Alone has been created by Andrea Crespi and Lorenzo Silva, two of the designers of the award-winning Potion Explosion, with stunning artwork by Steve Hamilton and highly detailed miniatures sculpted by Stephane Simon and Stéphane Nguyen Van Gioi. You can choose which side you weant to play as, the solo Hero or multitudes of Evil, the gameplay is completely different depending on your choice. The Hero can only see as far as his flashlight allows him, just a few sectors of the map at a time. Alone and abandoned, his life always threatened, he’ll have to be careful at every step. On the other side of the fence, hidden behind their screen, the Evil players can see everything. The whole map is always available to them, at all times. They can use cards to spawn and move hideous creatures and place insidious traps, all to make the Hero’s life as difficult as possible. Lost in the darkness, the Hero is under constant threat. In Alone, it is always the Hero’s turn, there is no proper “Evil turn”. The Evil players can only React to the Hero’s Actions, to interrupt his game flow and attempt to really spoil his day. The Evil players’ gameplay is all about cunning, setting traps and plotting schemes. The Hero has a certain number of Action Points (AP) available in his pool each turn. He can spend APs to perform Actions like Explore (to reveal unknown parts of the map), Move, Run, Attack, Search and Use Items. With his Radar he can know the distance between his current location and his chosen destination, and gather clues on the position of the Evil traps. He can also perform several Engineering actions, like Combine Items (to upgrade their effects), Repair Lights (to switch the lights back on in selected parts of the map, to gain an advantage over Evil), Defuse Traps and Weld/Unweld Doors. When he has spent all the available APs, his turn is over. The Hero has 2 Health meters: the Health Points meter and the Self Control meter. The HP meter measures the physical damage he takes, while the SC meter measures the psychological damage. As the Hero takes damage (of both kinds), his life will be more and more in danger, but the amount of Adrenaline at his disposal at the beginning of each round is gradually increased, and Adrenaline is one of the strongest assets for the Hero because it allows him to prevent Evil Reactions. After each Action performed by the Hero, the Evil players have the chance to perform a Reaction to hamper the Hero’s efforts. To do so, they rely on their card decks. They can play cards to activate many different kinds of instant effects, ranging from performing powerful special attacks or giving game-altering Statuses to the Hero. They can also discard cards to spawn or move a Creature, or to place Alert tokens that trigger bonus effects when more cards are played. There are 4 Evil card decks, each one with a different theme. Each Evil player chooses one at the beginning of the game, thus choosing a different gameplay style. A different Evil player will be appointed as Leader each turn; since the Evil Leader draws more cards, his gameplay style will be prominent while he’s in charge, forcing the Hero to adapt to different kinds of challenge each round. The miniatures shown are resins but miniatures in the production Alone will be pre-assembled plastic. So far the whole project seems like a great idea, I would have liked to have seen a single player option but how the mechanics look I’m not 100% sure how this could be achieved. Hopefully we will have more good news from Horrible Games soon.